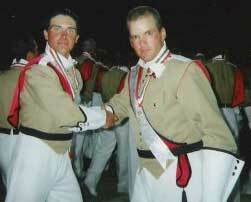 This is a pic of Jay "Spartacus" Spirakis and Mike Krecji, who marched together at Phantom Regiment for three years and both aged-out in 2000. Photo courtesy of Allison Scallan. View the Forzato archives E-mail your Forzato submissions to dave@dci.org along with where and when the photo was taken, and send some biographical information about yourself as well. We'll give you full credit. Also, let us know if you want your e-mail address included, to get feedback from other drum corps fans.